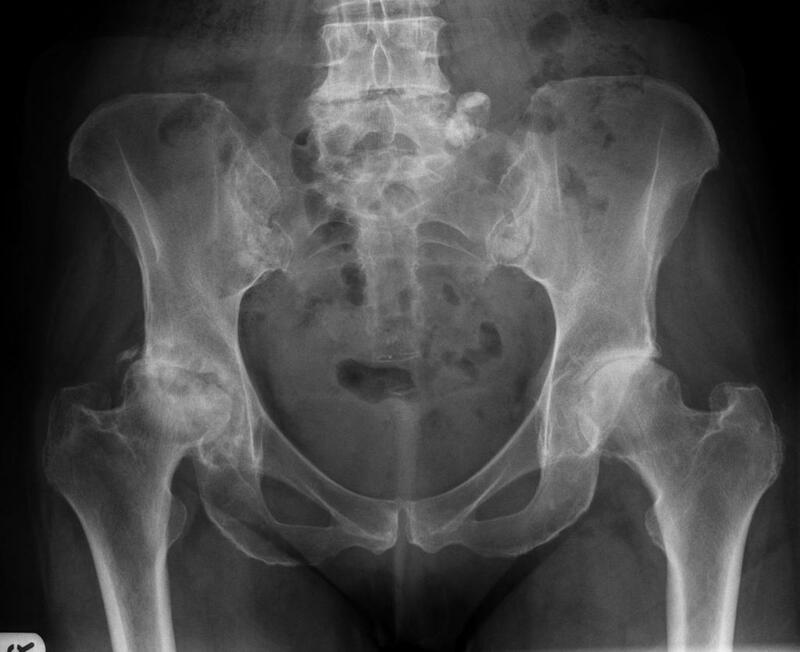 Osteoarthritis of the hip joint. Right side worse than the left with a loss of joint space + subchondral sclerosis and geodes. Remodelling is also present in the hip joint. OA is characterised by the loss of cartilage in synovial joints leading to changes in the periarticular bone.¹ Interestingly there’s more evidence of an inflammatory component to it’s pathology rather than just purely wear-and-tear. Only advanced damaged from OA show up on X-rays.¹ Other investigations such as arthroscopy and MRI may be able to show damage in earlier stages. Kumar P, Clark M (eds.) Clinical medicine. 7th ed. Edinburgh: Elsevier Saunders; 2009. p.518-521.